2 Using a folk prick the pitta bread on one side all over, this will stop the pitta bread puffing up in the oven and allows the steam to escape. 3 Place the pitta bread on a baking tray, pour on the passata and spread all over the pitta bread stopping ½ cm from the edge. 4 Sprinkle the oregano over passata, place the cheese on top, then the mushrooms and place in the oven for 5-10 minutes until it has a light golden colour. 5 Put the green beans in a bowl and pour over boiling hot water, cover and leave for 2 minutes. After 2 minutes drain off the hot water and pour cold water on top. 6 In a large bowl put in the baby kale leaves, red pepper and orange tomatoes. Drain the cold water off the green beans then add them to the bowl. 7 Put the ingredients for the dressing in a jar and shake or in a small bowl and mix. Then pour the dressing on to the salad and toss. 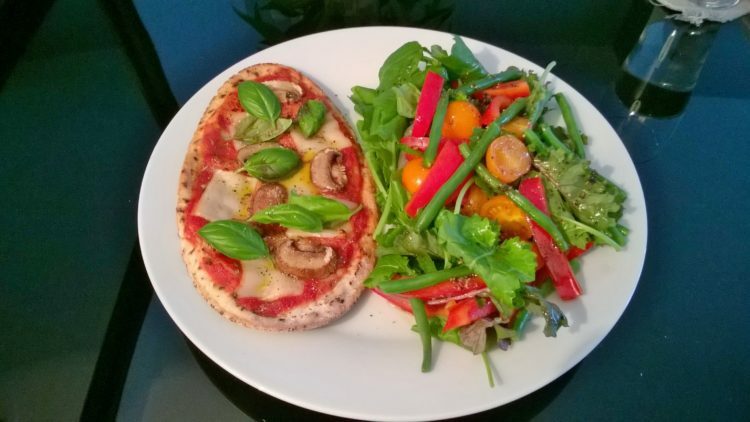 8 Remove the pitta pizzas from the oven and place on the plate. Add the cracked black pepper, the basil leaves and drizzle with chilli oil. Then serve with the salad the salad on the side.